The DLC is now 50% off in the Ubisoft store if you have a code for it. Has anyone else taken advantage of this yet? I was in no way going to spend $10 for each, but I gladly spent that for both. Only problem is Ubi still cannot do math and instead of it dropping to $4.99 from $9.99 each, it dropped to $5.99. I swear, these people are either idiots or genuises depending on how you look at it. Either way, if you were holding off on this because of the price like I was, now may be a good time to grab them. Ubisoft launches an official website for the Might and Magic brand. The site www.mightandmagic.com is basically a gateway for the entire brand. It contains some information about the current world and the games former legacy. You can find information about most of the games under the brand (Upcomming, current and also oder games), with links to websites and online shops. 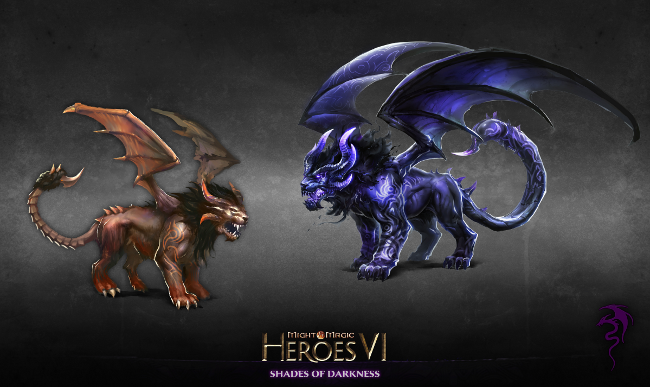 There is also some more information about several Heroes (Not only from Heroes VI), Dragon Gods. More information is announced to come as well. No name for it though. Also the factions page of the new site is up. Edited by Elvin at 16:34, 07 Dec 2012. 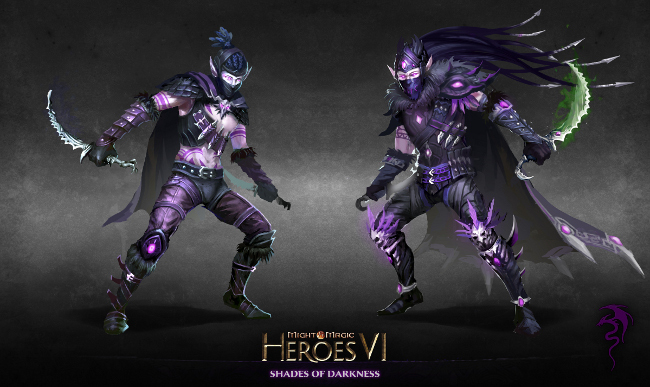 Heroes, today we are thrilled to announce you the date of the official release of the long-awaited Might & Magic Heroes VI standalone expansion, Shades of Dakness. It will be released on the 28th of February 2013. Starring the cult hero Raelag, first introduced in Heroes V, this fully fledged standalone game will feature a new faction, Dungeon, led by the Dark Elves, and a new story unveiling another piece of history in the Might & Magic Universe. Players can also enjoy the full experience with Might & Magic Heroes VI Complete Edition, containing the enhanced game, all bonus maps & items, adventure packs, the original soundtrack of the game and the Shades of Darkness expansion, set for release on PC on the same day. 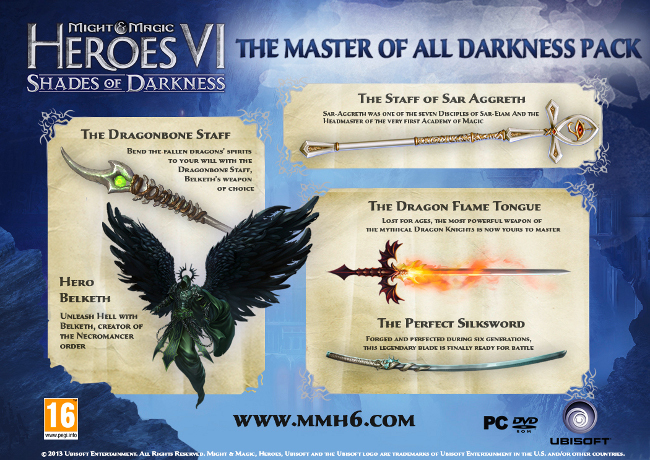 Might & Magic Heroes 6 Standalone and Complete Edition will be released on the 28th of February 2013. There is also a new page explaining the Might & Magic history. It starts from the Mythic Age and creation of the Shantiri empire, follows through the 6 eclipses and onto the coming of the Dark Messiah. It contains the clash of heroes and dark messiah storylines in case anyone missed them. Like the Harpies and Centaurs, the Minotaurs are Beastmen, created by the Wizards of the Seven Cities in the year 512 YSD. 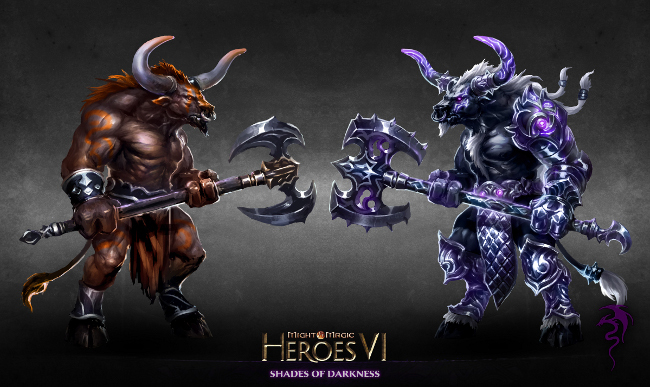 Half-human and half-bull, the The Minotaur was meant to be the shock infantry to fight alongside the Centaur cavalry. As for a Minotaur Guard, the Crimson Wizards of Al-Rubit, in a diplomatic gesture that surprised many and angered their neighbours in the Silver Cities, made a gift of one thousand loyal Minotaurs to the Dark Elves. In a short period of time, the Minotaurs took oaths of loyalty to the Dark Elves and Malassa. The Dark Elves that appreciated their strength and loyalty gave them freedom instead of using them as slaves. Both sides have benefitted from this new friendship since. - Shades of Darkness on Actionscript. Black Dragons are confirmed in the expansion, together with some information of the two capaigns that this expansion will have. Edited by Dave_Jame at 20:27, 09 Jan 2013. There is Christmass magic in the air. Edited by Storm-Giant at 18:48, 02 Jan 2013. The Manticore is a Magical Beast created during the Mythic Age. At that time, the surface of Ashan was irrigated by Dragon Veins. Beasts that drank these untammed rivers of dragonblood crystals were permantly altered by their powerful magic. The Manticore seems to mix features of various animals: lion, bat, scorpion. The Manticore is notorious for its venomous stinger. Its poison corrodes the hardest materials like acid and cripples the muscles, inducing a progressive paralysis. The Scorpicore is a Manticore that the Dark Elves exposed to an underground Nexus of dragonblood crystals attuned to the elemental powers of Darkness. This makes the magical beast more powerful, and more receptive to its master's commands. The Shadow Dragon is the avatar of Malassa, the Dragon Goddess of Darkness. They take the form of a dragon of onyx, with purple orbs embedded on their wings &#8211; these are the eyes of Malassa, capable of seeing any kind of shadows, litterary or metaphorically. The Shadow Lurkers are said to be born from these glowing orbs. When a Shadow Dragon unfolds its wings in anger, the countless eyes mesmerize its enemies, summoning all kinds of terrifying nightmares in their broken minds. If a more deadly course of action is required, the Shadow Dragons can count on their physical might and their withering breath, that will slowly but surely consume their victim's lifeforce. The legendary Black Dragons are the ultimate evolution of the Shadow Dragons. On their wings, the eyes of Malassa are replaced by intricate patterns of light constantly dissolving, like galaxies being swallowed by the eternal darkness of space. Edited by Storm-Giant at 18:09, 15 Jan 2013. 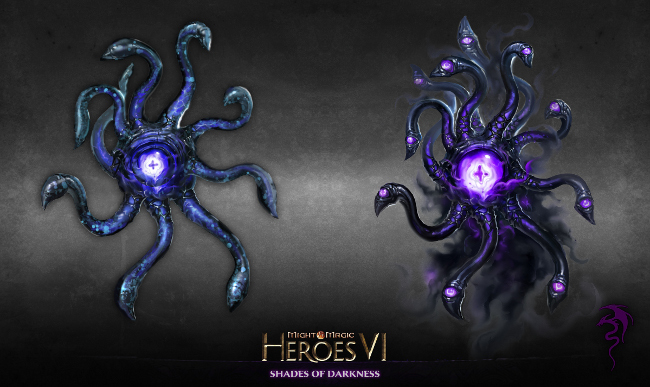 Have a look at this gorgeous mount you'll find in Might & Magic Heroes 6 "Shades of Darkness". The mount does not have any name yet, want to give us a hand? Get back tomorrow and vote for the best name on Facebook! - Shades of Darkness will have a more mature plot, just like Danse Macabre did. - Dungeon will feature some new skills. - Again, no big changes/improvements for the game - that's mean no skill system revamp, no Sim Turns or Battle Replays, for example. Also, no improvements for the map editor. Edited by Avonu at 23:30, 05 Feb 2013. Vein is a very old and powerful Death Knight. He didn't choose in the first place to live the so-called life of the Undead. Belketh turned him to save his family from certain death caused by a magical plague. Vein is the only one who survived. He then spent centuries in Belketh's service and rode alongside the Shadow of Death: Sandro. It was during those years that he earned the title: the Reaper of Souls. When Sandro was discovered to be a Netherlord, Vein hunted him down, killing all of his followers, but Sandro himself was merely exiled by Belketh. Enraged, Vein left the Necromancers for a brief century to become a mercenary captain in the elite brotherhood of the Windswords. Matter of fact, Vein has seen it all and is rarely surprised. He never shows emotion, and when he says &#8220;yes&#8221;, it means &#8220;yes&#8221;. His words are not calculated: they come from a mind that is at ease with all of the difficult decisions he has made throughout his existence.Though, sometimes, he cannot help from thinking what his life would be, had he died from the plague like his parents, and passed on to Asha to be reincarnated. Belketh is extremely old and wise, even by Angel standards. It was he that rediscovered the art of necromancy and taught it to Wizards of the Seven Cities. His research is not at an end: he hasn't found yet the path of enlightenment travelled by the wizard Sar-Elam, the Seventh Dragon. Based on that, seems like I only miss the Succession Wars map from the total package, as I pre-ordered the Collectors version of the main game as well as pre-ordering SoD. Read carefully - it's included as well. And I remind you that you can only post here to bring any kind of news related to the game - so if you have anything more to add/ask, go for the Expansion Discussion Topic or FAQ & Questions topic. Thank you.